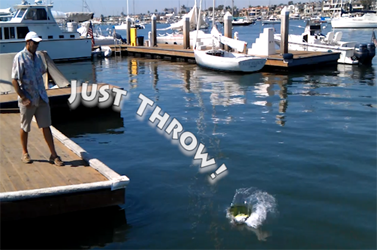 In this man overboard buoy demonstration video, we tossed the inflatable dan buoy into the bay to demonstrate how it works. For video of the test deployment, click to read the entire post. When you receive your self–inflating man overboard dan buoy, you must prepare it for use. To prepare it, install the supplied CO2 cartridge, and repack the unit, shown in the video below and in the dan buoy documentation. With CO2 cartridge installed, and the unit repacked, you are ready. Immediately after your crew goes overboard, Just Throw the dan buoy as is, into the sea, toward your crew. The dan buoy automatically inflates, which makes your man overboard significantly easier to see and rescue. It has an automatic strobe for night use. It has a whistle for fog. It has an eight foot fluorescent yellow streamer which enhances daytime visibility against a cluttered background. It has an extra large drogue to retard drift. In case you might have trouble keeping your crew onboard, put aboard your vessel some recharge kits so you can repack and redeploy your dan buoy! Background music in the video is Frédéric Chopin's Étude Opus 10, Number 1, performed by Chiara Bertoglio. Awesome! the DAN BUOY is a clear must-have for every Boater. Best in class! A must have for any boater.